1. Preheat the oven to 200°C, gas mark 6. Prick the potatoes with a fork, brush with the oil, season and place directly on the top shelf of the oven. Bake for 1 hour, until the skin is crisp and the flesh is soft to the point of a knife. 2. Meanwhile, put the lardons in a cold, dry frying pan over a low heat. Cook very slowly for 10 minutes, until the fat begins to run. Turn the heat up to medium, then after 1 minute add the salad onion and cook, stirring occasionally, for 5 minutes more, until the lardons have turned golden and crisp. Drain on kitchen paper. 3. Once the potatoes are cooked, hold them with a tea towel, halve lengthways and scoop out most of the flesh, reserving the sturdy shell left behind. Roughly mash the flesh in a bowl with the butter and soured cream, the crisp bacon mixture, ½ the chives and just under 2/3 of the grated cheese. 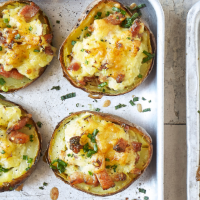 Season and spoon back into the upturned potato skins. Put on a baking sheet. 4. Scatter with the remaining grated cheese. Return to the oven for a further 15 minutes, until golden. Sprinkle over the remaining chives before serving. This recipe was first published in Thu Aug 30 16:28:35 BST 2018.